Free to join and offering over $450 in prizes, don't miss the opening round of our AFL 2012 Footy Tipping Competition. Are you a footy tipping expert? Join our Footy Tipping competition to find out how you rate amongst other local tippers. The competition is open for all to join now, with tips for the 1st round closing at 5-30pm on Saturday 24th March. To participate in the Footy Tipping Competition simply join online at www.pattersonroad.com.au and enter your weekly tips by 5-30pm on the day before each round starts. If you miss a week you will be awarded points for the away game results. You?ll also find loads of team and game history to help with your tipping as well as the weekly league ladder once the season is underway. There are prizes awarded each week as well as end of season prizes. In total there is over $450 in prizes to be won throughout the competition, so join up now! It's free to join and to enter your weekly tips for all of the 2012 AFL season. Top ups for myki, Melbourne's new public transport ticketing system, are available at Patterson Road Tatts, News & Post. 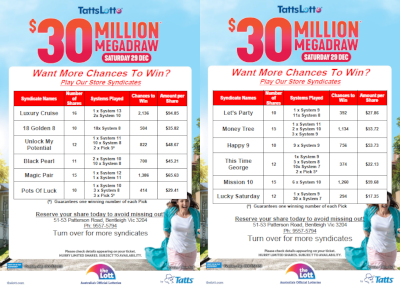 Superdraw syndicates and advanced entries are now available for the $21 Million TattsLotto Superdraw on 31st March. Call in today and pick up your ticket to dream or contact us to reserve your syndicate shares. Among the offers you will find a 7 day home delivery subscription to the Herald Sun for just $7.95 a week! You can find the publishers? subscription offers by visiting our website using the links below. If you have parcels to post for family, friends or business or are selling on ebay and need to get your parcels on their way our convenient Post Office hours help you to get it all done at a time that suits you, including all day Saturday & Sunday mornings. As well as getting your parcel in the post we can also help you out with satchels for Express Post, Registered Post and Parcel Post and mailing boxes, tape and other packaging products.